How do dead chickens put a child with special needs in an adaptive bike? How does playing Beer Pong allow a non-verbal child a chance to communicate through an Ipad? 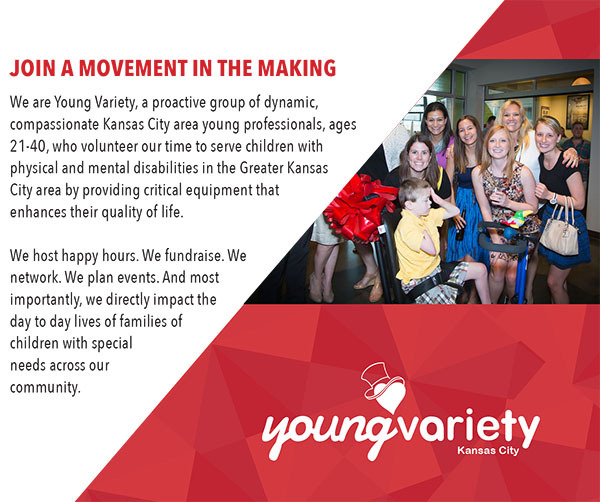 These are just a couple of the ways in which Young Variety KC has supported Variety Kids of KC this year. We like to say that Young Variety is not afraid to color outside of the lines, which is perfect for serving a population of children that don’t always fall in between the lines. Five years ago Tent 8’s Young Variety, under the leadership of president, Tim McCoy, was formed to bring a fresh youthful passion and perspective to fundraising. In 2014, they once again upped their game! Beer Pong for Babies raised $5,000. 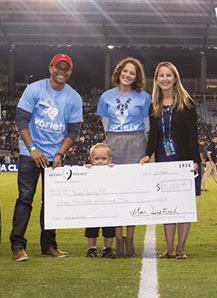 This year, in addition to a $15,000 gift, Young Variety worked with Sporting KC (championship soccer club), to secure Variety families tickets in the Victory Suite, a shared partnership with the Victory Project, and field time with the players. The resulting partnership has opened doors for a much larger project currently in the works. Using social media to engage others and spread the word, past and present Young Variety events like the Snuggie Party, Beer for Bikes and Club Events/Wine Tastings; have become legendary. These highly creative events make them darlings of the media, further spreading Variety’s mission. With very little turn-over, the core of Young Variety is a dedicated group willing to share their time, resources and talents. This year Tent 8 Young Variety was honored to submit the winning logo for Young Variety (nationwide). Pablo Picasso once said it “takes a long time to become young.” With Variety celebrating its 80th year this past year, they have proved Picasso right. Variety’s long success has inspired the young – and in turn – Young Variety ensures Variety’s continued ability to help. As children once helped by Variety begin the join Young Variety, and older Young Variety members “age up” into traditional Variety activities – it is easy to see how the enthusiasm and generosity of the today’s young paves the way for a stronger Tent 8 in the future.